My son turned six last weekend, and in the fall, he will enter into first grade. As a good mother and reading teacher, I encourage my son to read daily. We've made several trips to the library and my son even got his very own library card. Many pictures books are written on a 3rd grade level, so we've been checking out easy readers. Sometimes easy readers don't always have the best plots, given the use of restricted language to keep the text easy enough for beginning readers. However, recently my son and I came across a cute easy reader that helped him make connections and predictions about the story as he read. 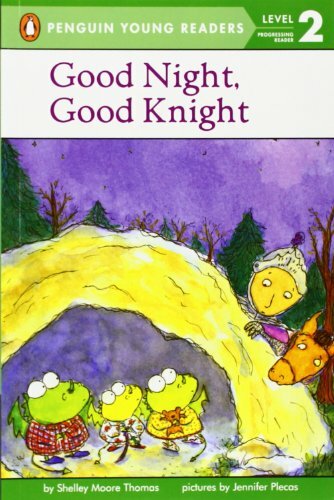 Good Night, Good Knight written by Shelley Moore Thomas and illustrated by Jennifer Plecas, tells the story of the Good Knight who stands guard keeping the castle safe from the dragon. Good Knight hears a loud roar and discovers three baby dragons who can't sleep. One dragon needs a story, another a story, and of course they all need a good night kiss. After several trips to the cave, Good Knight follows many of their requests and finally gets the baby dragons to sleep. This story lends itself well to making connections because children can relate to calling their mothers into their rooms at night for one more drink of water, one more story, and an extra goodnight kiss. My son had a great time predicting what the dragons were going to ask for next.